What would it take to boost your patient conversion rate by 10%, 20% or even 30%? How would that change your healthcare practice next year? The problem for many practices isn’t that they don’t have enough leads coming in. It’s that those leads aren’t converting. Every lead is a potential new patient. Your job as a healthcare marketer is to turn those leads into happy, loyal patients. Awareness. At this stage, the patient is trying to identify a need. Your marketing content should focus on educating the patient about the problem. Consideration. The patient now understands the problem and has moved into the process of considering his or her options. This is the time to present specific information about the various solutions available with in-depth content like guides or videos featuring physicians. Decision. 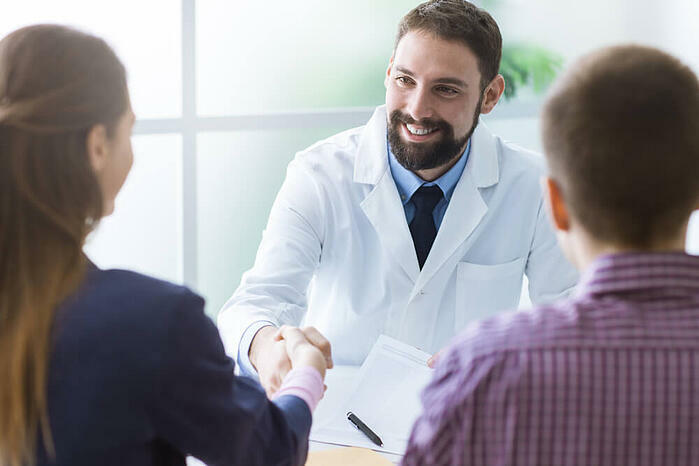 In the decision stage, the patient considers which practice can meet his or her needs based on specific offers and benefits. Successful lead conversion takes more than simply presenting the right information at the right time. It’s not enough to publish content and hope those potential patients will pick up the phone and call you. So what’s the key? What is missing from your lead conversion strategy? Lead nurturing simply means engaging and educating each lead (potential patient) to help them take the next step in the patient journey. It uses strategies like email marketing, segmentation and follow-up to qualify leads and hold their interest. And the ultimate goal of lead nurturing? Conversion. Let’s take a look at seven ways you can build a strong lead nurturing strategy. Segment your leads. Blasting out content to everyone on your contact list is just about the worst possible way to convert leads. Why? Because different people want to know different things. Instead, use patient personas to understand the needs and interests of different prospects and tailor content to different stages in the patient journey. Provide valuable content. Talk less about your practice and more about the needs, benefits and interests that matter to your prospects. Educate leads and provide useful content that answers the questions they have at any given stage in the patient journey. Then, and only then, present your call to action. Create targeted email campaigns. Segment your email lists to correspond with different types of leads. Create email drip campaigns to engage those leads with targeted content and present them with offers tailored to their unique needs and interests. Create a series of micro-conversions. Of course, the ultimate goal is for the prospect to pick up the phone and make an appointment, but you can start with smaller conversion goals. Every desirable action on the part of the lead can be considered a conversion. These might include opening your email, clicking on the CTA button, downloading your lead generation piece, signing up for your email list or clicking through to your website from a social media post. Every conversion moves the prospect closer to becoming a patient. Provide the right offer. Every time you interact with a potential patient, you should present him or her with an offer. The right offer can increase your response rate by up to 300%, so it’s worth taking the time to find out what matters to each segment of your audience. Follow up. Then follow up again. The vast majority of conversions take place after several interactions. Rarely does a potential patient make that appointment the first time they get an email from you or see your Facebook post. In fact, it may take four, five or six follow-ups before that lead becomes a patient. Don’t quit too soon! Know your data. Track key metrics like conversion rate, click-through rate, time spent on page, time spent on site, visits before conversion and email open rates to determine how well your lead nurturing campaigns are performing. With the right data, you can see exactly where to invest your efforts and which strategies have paid off. Every successful marketing campaign works relentlessly toward lead conversion. Patients need to know more than just “what” you offer. They also need to know “why” it matters to them and why they should take the next step. Lead conversion isn’t a one time event. It is a series of steps strategically designed to move the prospect incrementally closer to becoming a patient. Do you need help designing a targeted lead conversion strategy? Our healthcare marketing experts are standing by to answer your questions. Call today for your free consultation!